If you are looking for a deluxe holiday home that is comfortable and well-equipped, this 4.5 star villa for 20 people has all the amenities you need for a relaxing group stay. Remark : The owner lives in another house on the same property: the two houses are about 30 m apart, so everyone’s privacy is preserved. If you stay a little longer, you will better enjoy this luxurious villa with all its wonderful comforts and you will have more time to explore the many wonders of the surrounding region. 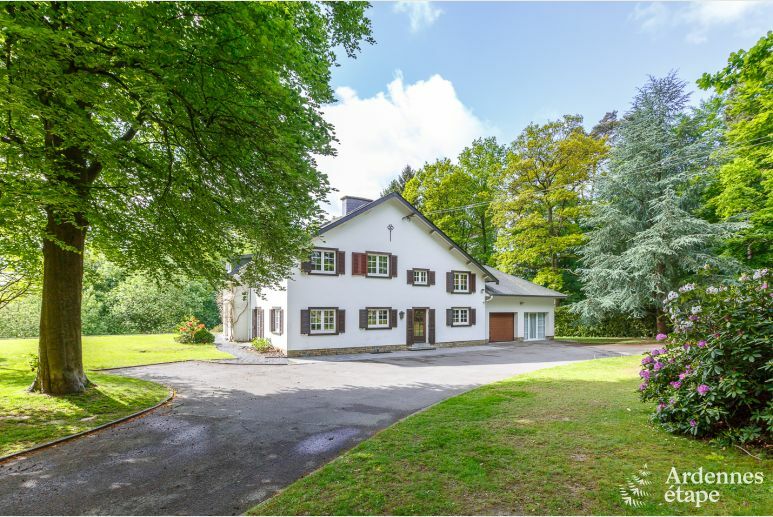 Located in a wooded park on the hills around Spa, this fantastic villa will delight guests who have a taste for luxurious accommodation. Offering a warm atmosphere and first class amenities, such as an indoor heated pool, a sauna, a jacuzzi, a hammam, an open terrace, and an indoor barbecue; you will have an unforgettable stay with family or friends. Featuring eight bedrooms and six bathrooms in total, this group accommodation consists of two parts: the main house with six bedrooms; and a separate two bedroom apartment, which gives a little more privacy to a part of the group. On the ground floor, the spacious dining room connects with the bright living room creating an inviting atmosphere. Also, the house features an indoor barbecue, which will add a unique touch to your meals. The large wooded garden is very pleasant and offers stunning views of the surrounding countryside. Please note: the owner lives in a separate house located in the same property; the two houses are about 30 meters apart, so everyone's privacy is preserved. Overlooking the Lake of Warfaaz, it is possible to get to the lake from your villa via a wooded trail. It is a lovely walk for the whole family. When you get to the lake, we suggest you visit Le Petit Baigneur for a fine dining experience; or to simply go around the lake in a pedalo, the children will love it! The villa is just five kilometers away from Spa and near the Thermal Baths. If you want to go for a night out, head to Havana Café for a nice and warm ambiance. For a thrilling adventure, go to Skydive Spa (reservations required) for an adrenaline rush. Please note that access to the two-bedroom apartment is via a small private courtyard. A wellness area worthy of a 5 star hotel, first class comfort, and a great location; are some of the features that make this wonderful house the perfect spot for a relaxing group holiday. Sart-lez-Spa is a village that is located at the edge of the High Fens, in the Belgian Ardennes. It is a village packed with history, which becomes visible thanks to the many sandstone houses. Tradition also has a strong presence, especially because of the leatare carnival and the festivities of ancient professions. On top of that, Sart-lez-Spa is only 20 minutes away from Malmedy, a city that is also well-known for its folklore. Zeer groot huis, wel dure verwarmingskosten door grote ruimtes, enkele buitendeuren met enkel glas, zwembad zeer goed en groot, dat is absoluut top, appartement enkel langs buiten te bereiken. Hebben al meermaals zulke huizen gehuurd, energiekosten vallen altijd tegen, vandaar ook de hoge waarborgen! De eigenaar sprak geen Nederlands en/of Engels. Echter was het wel een zeer aardige man. Hij en zijn gezin wonen naast het huis, maar hier heb je geen last van. De energiekosten + borg zijn wel aan de dure kant!